Forbidden Broadway has been a staple of the theater scene for 35 years. Never has there been a singular sensation that Gerard Alessandrini has decided to lampoon on its own. Hamilton has taken the world by storm and strategically gets a spoof musical in Spamilton. Doing what Alessandrini does best, Spamilton is a piano parody of the most hyped Broadway musical of all time. 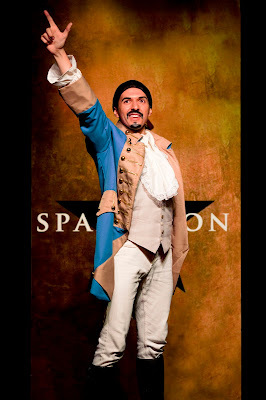 Gerard Alessandrini did not throw away his shot to give the parody treatment to Lin-Manuel Miranda's Hamilton. Bringing his infamous dose of comedy, Spamilton mocks the 11 time Tony-winning show and it's cast and creatives. It's not lyrical wizardry but Alessandrini certainly does an admirable job spoofing Lin-Manual Miranda's words, finding the cheap and easy jabs that get the audience laughing. With hundreds of directions he could have gone, some song's content are brilliant, like "Straight is Back", while others induce some sighs of why, namely "Daveed Diggs'" doing tragically outdated "Fresh Prince of Bel Air Theme Song." But like most parodies, you can't win them all. Even though Hamilton is the prime target of the show, the piece doesn't have the strongest of structures. It mostly sticks to the song order from the source material but it still feels like a regular Forbidden Broadway revue. There is a plethora of loving homages to other Broadway classics' sprinkled in for the tasting. Spamilton is a sure-fire crowd pleaser, whether or not you're part of the elite club who were in the room where it happened. Alessandrini, who also directs, maintains the comedy, implementing any and all sight gags possible. Whether it's through puppets or the iconic Hamilton star placed on both cheeks by costume designer Dustin Cross, Alessandrini provided enough Easter eggs for any super fan to keep hunting. Even on the tight stage at the Triad, choreographer Gerry McIntyre brought a little Hamilton pizzazz, mimicking the original’s. It’s simple and effective. In the world of parody, embodying the person you’re mocking is essential. It needs to go from look to sound. It seemed effortless for this cast. As the beady-eyed Lin, Dan Rosales matched the enthusiasm of his real life counterpart. Taking on the Daveed Diggs track, Tristan J. Shuler’s smile and excitement matched his big hair. Taking on the women of the world, Nicole Ortiz, who replaced Nora Schell, receives some of the biggest laughs thanks to her Schuyler sister number. Ortiz’s ability to vocally transform quickly is impeccable. Spamilton, which is transferring to a venue only blocks away from its inspiration, is a laugh riot of a spoof. If you are a Hamilfan, it’s a show to end all shows. If you never really got the hype, this is your opportunity to let Gerard Alessandrini mock everything you’ve always wanted to. Spamilton is bound to have a life as long as Hamilton is around. The test will be how frequently the piece gets updated.